"BSP initially divides your map into 1024x1024x8192 sections." I wasn't able to see the effects of it when I tested it with gl_wireframe. Judging from old articles those cuts should show up brownish but I never saw those. Could you show me some examples? Let's get back to the compiler settings: Since SC does not have Software Renderer anymore, I would say we can make "subdivide 256" a default. Software mode was only one problem prohibiting 256 subdivision. RAD will mostly still crash when you're trying it or give you glitches in game. The problem with RAD is because of the way Half-Life handles lightmaps. The maximum size of a lightmap is 16x16 (this is a hardcoded limit in the engine). The engine calculates the size to use for each face using that face's size ('extents') and it's texture scale. This is why scaling up textures can reduce lightdata/make shadows blockier. Obviously, the compile tools have to use the same method of calculating lightmap sizes. Faces whose extents are greater than 240x240 will will cause RAD/the engine to try to assign a lightmap size greater than 16x16. Of course, the texture scale is factored in, so this is why faces with small scales are the first to cause problems. With SC5.0+, SC-SDK (Compilers and our increased Hammer grid size), we should probably check if someone got around to expanding the gl_wireframe code to the new limits. 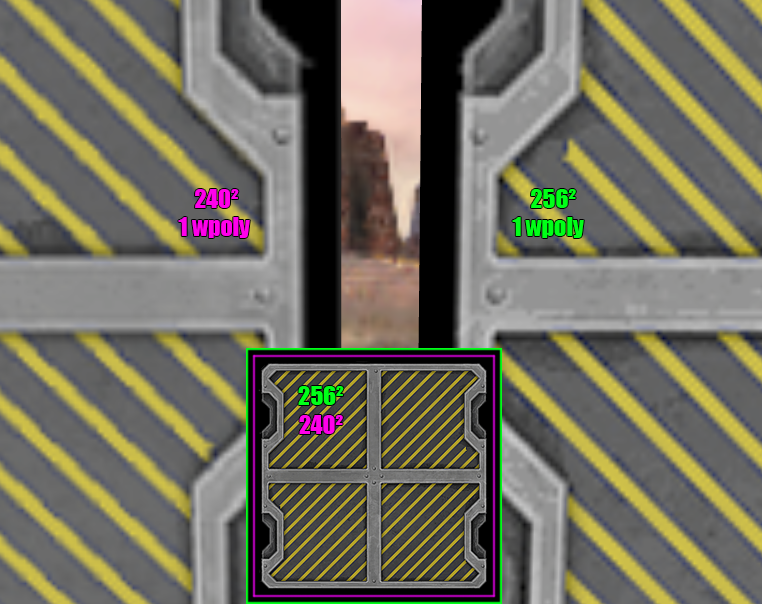 The "engine tends to see over everything [over 8192] in a large open area" comment was due to R_Speeds and realising the situation boils down to "pretending you have a 8192 high wall" infront of a player (which the SC engine will see over). Last edited by wolf-3d; 21-04-2018 at 01:43 PM. I think one thing hasnt been mentioned yet in this thread. Adding a 8px border around your 240² texture which will never be used or visable, just to increase the texture size to 256². Then in the editor you still scale your 256² texture to 0.534 (128² units brush). Giving you the advantage of both, good quality and low wpolys. Last edited by _RC; 03-06-2018 at 02:15 AM. @RC: That's also a nice way to do it. The next step is to increase the face subdivision scale. There have been some tests with higher values but it might still take some time and effort to get this feature in a future release. Until then 240x240 textures offer the best wpoly/quality value (especially since now they're not being resized anymore!). If you are currently making textures for future map releases, I'd say you initially create 512x512 or 256x256 textures. It might be possible that this becomes a possiblilty for regular use in the future. Then, for now, just create cheaper 240x240 versions of those textures. Once the render can handle higher dimensions better, you can easily swap them for their high-res counterparts.